Students were able to help their community during Service Week 2017. Dan Grinthal, a fourth-year industrial design student from Andover, N.J., wants to leave a positive mark on the world. 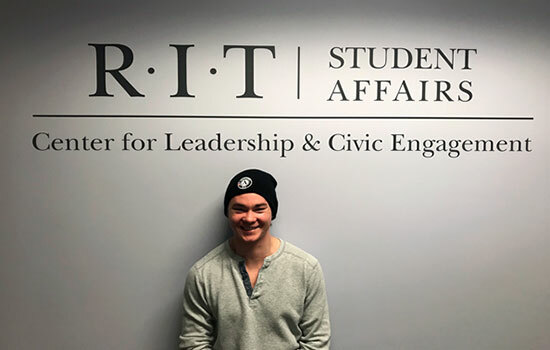 After participating in an AmeriCorps service project during his gap year in 2016, Grinthal came back to RIT knowing that his future, wherever it leads him, will involve sharing people’s stories and making a positive impact on people’s lives. Grinthal is working for the Center for Leadership and Civic Engagement as the Into the Roc Leadership Scholar and the student coordinator for Service Week, an annual week-long service event on campus. By helping coordinate all of the different clubs and organizations involved, Grinthal helps make sure that all of the projects scheduled to happen throughout the week run smoothly and successfully. More information about Service Week April 16-20 and the schedule of events is available on the RIT Service Week 2018 and the Center for Leadership and Civic Engagement Facebook pages. To host a service project for Service Week 2019, reach out to Kathryn Cilano, programs director at the Center for Leadership and Civic Engagement, at Kathryn.E.Cilano@rit.edu. Question: What can we expect to see during Service Week? Answer: Service Week 2018 is a celebration of service on the RIT campus. There are going to be about 20 events with clubs and student organizations across campus participating. 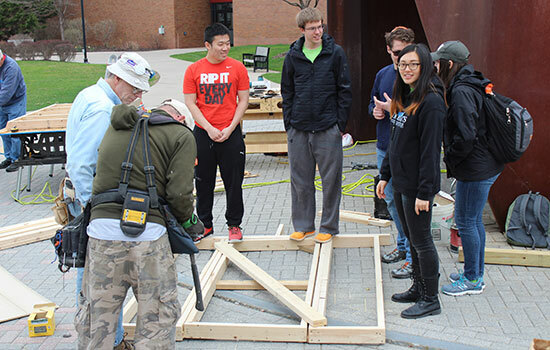 We are collaborating with the College Activities Board for Puppy-Fest, where there will be shelter pets, and we’re doing Framing Frenzy with Into the Roc and Habitat for Humanity. We have a couple of really big events like those and then a lot of really cool smaller and more intimate events spread across campus during the week. Student Government also partnered with us and they set up a ton of different events from making animal toys for donations to raising money for various charities, all sorts of things. Q: How did Service Week start? A: Service Week is in its third year at RIT and it’s a national initiative in a week of April. In 2016, Kaleigh Sweeney ’17 (industrial engineering) got together a bunch of people and hosted three events on campus. They put it on all by themselves, it was a student-run thing and there wasn’t any official support from the university. The next year, they had six events and the Center for Leadership and Civic Engagement (CLCE) office gave them some support help to coordinate and get things together in the hopes of getting this event off the ground. Bobby Moakley, the president-elect of Student Government, was the student coordinator that first year the CLCE was involved. Now, we’re in the third year with 20 events and we plan to continue growing. It really starts with students who are already doing service or who want to get more involved with their clubs and community. I would absolutely encourage you to reach out to the CLCE with your ideas for Service Week 2019 so we can include your project. Q: Can people participate in these projects between classes or is it an all-day commitment? A: We have a lot of variety. We have some events where you just pass through and it’s about five minutes of interaction, and other events you could spend a few hours there if you wanted to. We will be sending out a schedule with the names of these events and their locations so people who want to set up a schedule for all the events they want to go to can do that. Q: Are there any opportunities to get out into the Rochester community and do service projects? A: Most of the service projects are based on campus, but a lot of them have impact off-campus. For example, Framing Frenzy is building frames to be used in local Rochester homes that Habitat for Humanity is building. Lots of people are collecting materials or donations to send to local or national charities. There are a variety of ways you can make an impact off-campus even if we don’t physically leave. Q: How did you come to be involved as the student coordinator for Service Week? A: Last year, I joined the Reporter as a new writer. I had just finished a gap year with AmeriCorps NCCC, which is a federal national service program. I spent 10 months in the southern states doing mostly disaster relief, and I came out of it with the sense that I really wanted to do something that made a positive impact in people’s lives. I also knew I wanted to be a writer and tell people’s stories, so I put those two together and decided to write an article for the Reporter about the CLCE’s contribution to service events on RIT campus. I met my future bosses while doing the interviews for that article. Q: Why is it important to have an event like Service Week on campus? A: I think it’s very important for students to get out of the RIT bubble and look beyond the bubble of what they see and experience every day in class, in their major and in their personal lives. One of the ways to do that which is most impactful, at least in my experience, is getting involved in service and volunteer work. Service Week is a low-commitment and potentially really fun way to see what you can do beyond yourself. That can be a gateway to a more satisfying way of life. Events like this are stepping stones to creating a culture of service at RIT, and cultivating students who value who they are and what they can do can make a positive difference in the world, not just for themselves. This is Dan Grinthalâ€™s first year working with the Center for Leadership and Civic engagement and helping coordinate Service Week at RIT.